Constant Contact offers a top-notch emailing platform and now you can add the ability to send voice broadcasts and text messages to your subscribers using our new integration. It’s only required that you have an account with both services – there is no special hardware or software that you need to install. You will need an account with DialMyCalls as well as Constant Contact to utilize our new integration. The first thing you are going to want to do is log into your DialMyCalls account and navigate to “My Account” -> “Integrations” -> “Constant Contact”. 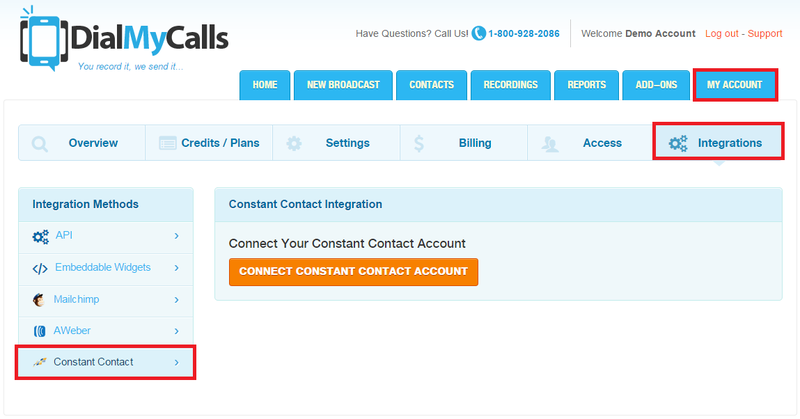 Above Image: Login to your DialMyCalls account and navigate to the integrations tab to connect your Constant Contact list(s). Upon clicking the “Connect Constant Contact Account” button you will be prompted to login to your Constant Contact account. Once logged in, it will ask you if you want to authorize DialMyCalls to utilize the account – click “Allow” to link your two accounts. 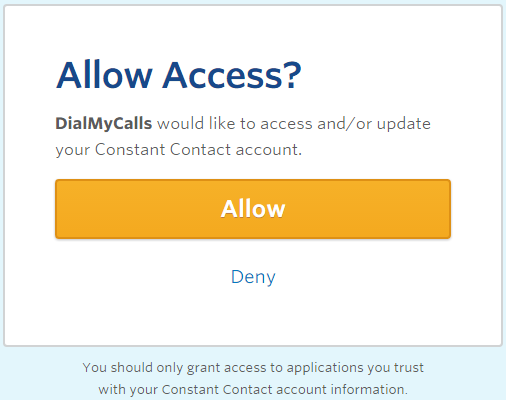 Above Image: Connect your Constant Contact account with DialMyCalls. 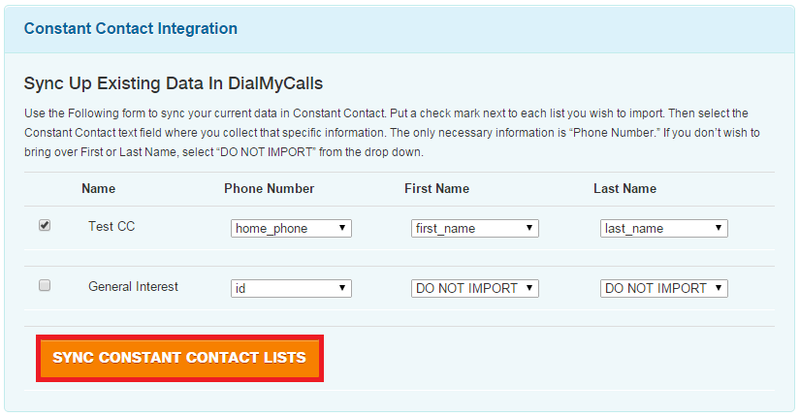 On the Constant Contact integration page in your DialMyCalls account you will now have the option to sync your existing data. Please select the subscription group(s) you would like to sync up with DialMyCalls and make sure that you choose the appropriate form fields – please keep in mind that a 10-digit phone number is required for the integration to work. Above Image: Once you have authorized DialMyCalls with Constant Contact you can sync your data. 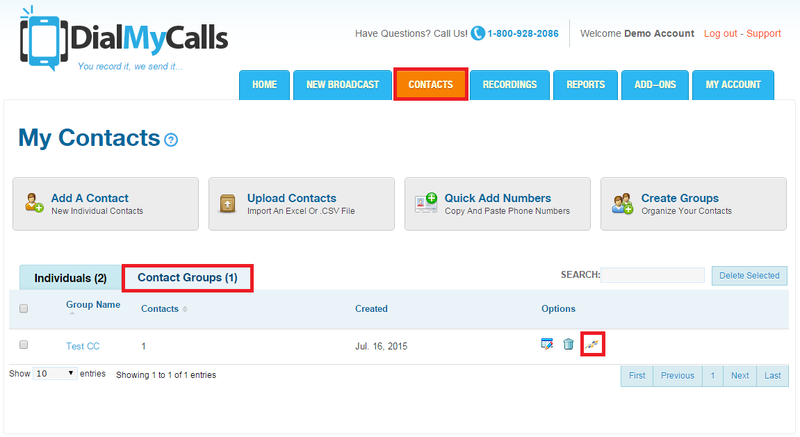 Your Constant Contact subscription lists that were synced will now be listed under the “Contacts” tab in your DialMyCalls account. Contacts and contact groups that are synced will have a Constant Contact icon to the right of them so that you can quickly and easily send a voice broadcast or SMS text message to the correct contacts and subscription groups. Above Image: Your synced Constant Contact subscriber group will create a contact group within DialMyCalls. Constant Contact users can now send out voice broadcasts and SMS text messages to their subscribers. The brand new integration with DialMyCalls makes a top-notch emailing platform even better by adding the ability to send out automated phone calls and text messages. If you have any additional questions on how to integrate your Constant Contact subscribers with DialMyCalls, please contact us.